Sorry to have gone these days without a post. We have not had a connection till today, and the connection is weak not allowing us to post pictures now. We will add some later with a better connection. 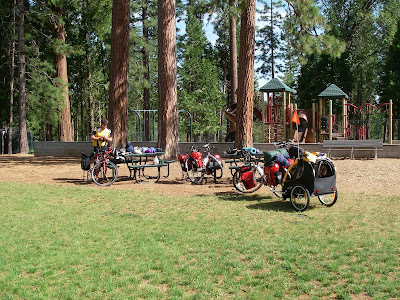 Tuesday we rode from Placerville to Omo Ranch in the foothills. We rode over several ridges making the riding very challenging. Two events towards the end of the ride made it very notable. As we were taking break a fellow tourist rode up and we began to exchange information (visit, gab). He is Phil from San Francisco and is heading to Virginia. He is traveling very light and fast as he has only two months for his adventure. As we were talking to Phil, a man pulled up in a pickup and asks where we were going. After we explained our various agendas, he explained that he (Rusty) was the principal at a very small school just ahead at Omo Ranch and offered us the opportunity to camp on the lawn of the school, just check with the custodian, John. Well we were wondering were we would spend the night so Rusty made our decision easy. When we got to the school we were welcomed and shown all the amenities, bathrooms and a full kitchen. Here is Phil with all the bikes on the lawn. 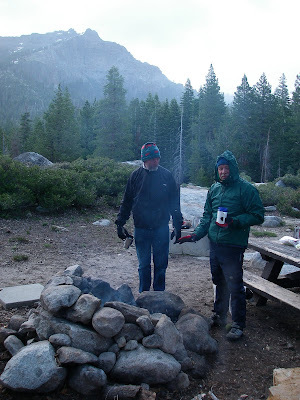 We pitched our tents and made dinner and had wonderful philosophical exchanges with Phil. We are grateful for the wonderful hospitality. On Wednesday morning, we left the school rested and refreshed for the challenging day ahead. The challenge was to climb 4400 ft. to Silver Lake just below Carson Pass. We rode out of Omo Ranch and road seemed to be much better graded than the day before. We climbed more rapidly and were soon at the junction with State Highway 88 that would take us over Carson Pass. Hour after hour we climbed and the end never seemed in sight. After 6 hours in the saddle we finally began the descent to Silver Lake. Quickly we descended and found the campground. 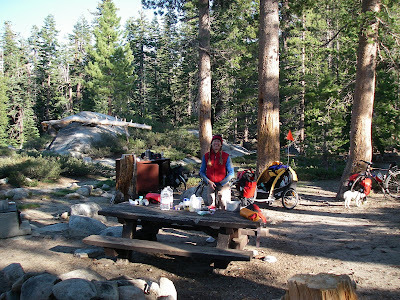 We set up in a beautiful site, had dinner and turned in quickly due to our fatigue and the dropping temperature. Thursday dawned with unexpected conditions!